From the late-19th to mid-20th centuries, a number of new taxonomic names including new generic names were proposed for early human fossils; most have since been merged with Homo in recognition that Homo erectus was a single and singular species with a large geographic spread of early migrations. Many such names are now dubbed as "synonyms" with Homo, including Pithecanthropus,Protanthropus,Sinanthropus,Cyphanthropus,Africanthropus,Telanthropus,Atlanthropus, and Tchadanthropus. Forensic reconstruction of Homo habilis, exhibit in LWL-Museum für Archäologie, Herne, Germany (2007 photograph). 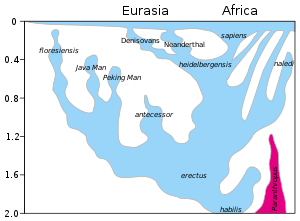 ^ The conventional estimate on the age of H. habilis is at roughly 2.1 to 2.3 million years. Stringer, C.B. (1994). "Evolution of early humans". In Steve Jones; Robert Martin; David Pilbeam (eds.). The Cambridge Encyclopedia of Human Evolution. Cambridge: Cambridge University Press. p. 242. Friedemann Schrenk, Ottmar Kullmer, Timothy Bromage, "The Earliest Putative Homo Fossils", chapter 9 in: Winfried Henke, Ian Tattersall (eds. ), Handbook of Paleoanthropology, 2007, pp. 1611–1631, doi:10.1007/978-3-540-33761-4_52. Suggestions for pushing back the age to 2.8 Mya were made in 2015 based on the discovery of a jawbone: Spoor, Fred; Gunz, Philipp; Neubauer, Simon; Stelzer, Stefanie; Scott, Nadia; Kwekason, Amandus; Dean, M. Christopher (March 5, 2015). "Reconstructed Homo habilis type OH 7 suggests deep-rooted species diversity in early Homo". Nature. 519 (7541): 83–86. Bibcode:2015Natur.519...83S. doi:10.1038/nature14224. ISSN 0028-0836. PMID 25739632. .
^ Confirmed H. habilis fossils are dated to between 2.1 and 1.5 million years ago. This date range overlaps with the emergence of Homo erectus. Schrenk, Friedemann; Kullmer, Ottmar; Bromage, Timothy (2007). "The Earliest Putative Homo Fossils". In Henke, Winfried; Tattersall, Ian (eds.). Handbook of Paleoanthropology. 1. In collaboration with Thorolf Hardt. Berlin, Heidelberg: Springer. pp. 1611–1631. doi:10.1007/978-3-540-33761-4_52. ISBN 978-3-540-32474-4. DiMaggio, Erin N.; Campisano, Christopher J.; Rowan, John; et al. (March 20, 2015). "Late Pliocene fossiliferous sedimentary record and the environmental context of early Homo from Afar, Ethiopia". Science. 347 (6228): 1355–1359. Bibcode:2015Sci...347.1355D. doi:10.1126/science.aaa1415. ISSN 0036-8075. PMID 25739409. Hominins with "proto-Homo" traits may have lived as early as 2.8 million years ago, as suggested by a fossil jawbone classified as transitional between Australopithecus and Homo discovered in 2015. ^ Bølling-Allerød warming period; Curnoe, D.; et al. (2012). Caramelli, David (ed.). "Human remains from the Pleistocene-Holocene transition of southwest China Suggest a complex evolutionary history for East Asians". PLoS ONE. 7 (3): e31918. Bibcode:2012PLoSO...731918C. doi:10.1371/journal.pone.0031918. PMC 3303470. PMID 22431968.